Crusaders boss Stephen Baxter believes the in-form Premiership champions can continue their winning run against Coleraine at the Showgrounds. 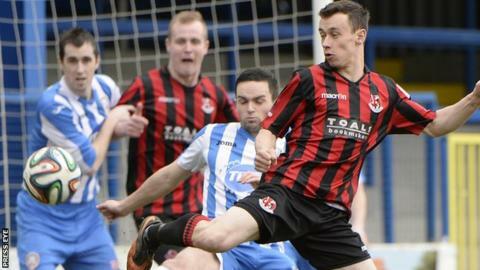 The Crues beat leaders Linfield last weekend to secure a fifth straight win and move two points behind the Blues. "Coleraine is always a difficult place to go but we will go to the Showgrounds with confidence," said Baxter. "We've done quite well up there in recent years although Coleraine have enjoyed a good run this season." He added: "They are a great side and for me they should be doing a bit better - two to three years ago I thought they were going to be title contenders." Grant Cameron is joined by Liam Beckett for commentary on Coleraine's meeting with champions Crusaders at the Showgrounds. Michael Hammond will take you the action from Solitude as managerless Cliftonville face Glentoran and there will be updates from the other four games. The Bannsiders lie fourth while Linfield will aim to bounce back from the 3-0 defeat at Seaview when they take on Warrenpoint Town in a top versus bottom encounter at Windsor Park. "Everyone goes through a blip but we have won seven out of eight games this season, which is a fantastic record," Blues manager Warren Feeney told the club website. "This is going to a be a hard game. Warrenpoint come here with confidence and all the pressure is on us, so we've got to make sure we are on top of our game." Cliftonville start life without Tommy Breslin in charge after his shock resignation earlier this week. Interim boss Gerard Lyttle will be at the helm for the first time on Saturday, with Glentoran the opponents at Solitude. Glens midfielder Kym Nelson is out after fracturing a foot bone in last Saturday's win over Portadown while Ciaran Caldwell starts a six-match suspension. A buoyant Ballymena United will hope to build on their 6-1 hammering of Cliftonville when they host Ballinamallard. Sky Blues defender Gareth Rodger could return from a hamstring injury while teenage sensation Matthew Shevlin is back after a week on trial with Crystal Palace. Portadown will be without suspended pair Keith O'Hara and Mark McAllister for the meeting with Dungannon Swifts at Shamrock Park. A ban also rules out Carrick Rangers midfielder Aaron Harmon from the home clash against Glenavon.